Why I gave half of my clothes away to the charity shop…. Some of the things in there were too small as I’d bought them in the sales over the years with the optimistic thought that I’d slim down into them but as I’m losing weight (slowly but surely) I’m changing what I like to wear which means that even though I hope to be able to fit into the things that fall into this category. They’re cluttering up my wardrobe when I can’t even wear them yet. This is a good problem to have in a way but there are clothes in my wardrobe that are too big. I’m two and a half stone lighter than I was at my heaviest but that’s taken a few years to come off with my on-off approach to losing weight. I have clothes from back then that are too big for me but that I love even though they’re not flattering due to the size of them. My tastes have changed massively over the years and I have clothes in my wardrobe that I don’t even like anymore. Things that I loved at the time when I bought them and wore them constantly – a pair of leggings with a chiffon skirt bit on the top are a prime example of this. I won’t wear them again but I still kept them hanging up, taking space in an already cramped wardrobe. Then there are things that need repairing like a pair of jeans with a dodgy zipper that has been hanging there for at least three years as I’m not really a jeans person anyway. There’s the trousers that are too long, the skirt that’s too short, the dresses I know I’ll never wear again and the random things that I have no idea why I’ve bought over the years (I’m looking at you orange top with green pineapples on). So, realising that so much of my wardrobe wasn’t wearable prompted me to have a good clear out which resulted in two full black bags filled with clothes going to the charity shop and a couple of things being sold on eBay. At this point, my wardrobe was half empty but I wasn’t in a rush to buy more clothes as the ones I had left in there were the clothes I’d kept because I wear them regularly. 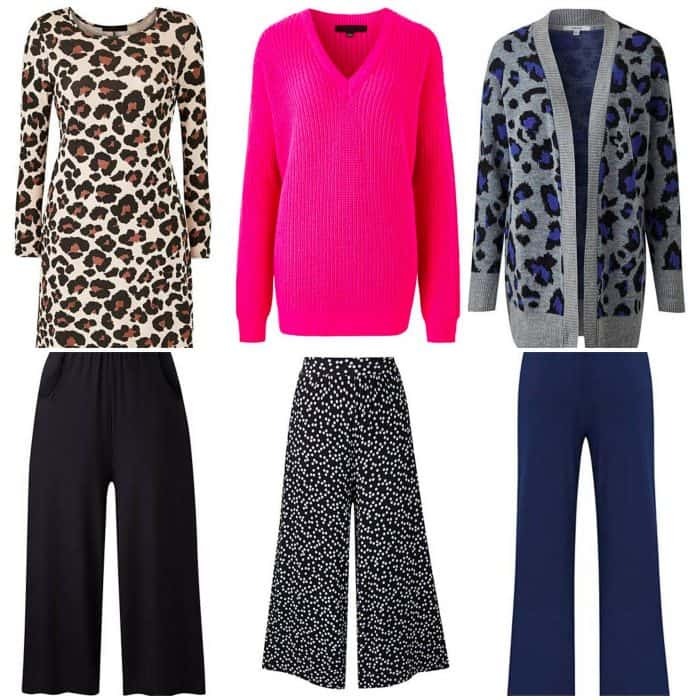 Even so, when the lovely team at Simply Be messaged me to ask if I wanted to choose some of their clothes to review I replied to say yes please and set about choosing some new clothes to try with my new list of criteria. I’m trying not to wear anything that’s ‘on trend’ unless it’s something that I genuinely like and will be happy to wear even when the trend is long gone. I also want to try and only buy things that I know will go with something that I already own and are good quality clothes that will last. The first outfit is a lovely leopard print swing dress which goes lovely with a pair of tights, leggings, jeans and looks amazing with the amazingly comfortable jersey cullottes which have fast become my new favourite bottoms as they’re so comfortable and can be dressed up with a pair of heels or down with my Converse. They wash lovely and go with so many of the things in my wardrobe. The next outfit I have is made up of this super bright neon pink jumper and a pair of spotty cullottes which I bought myself after I realised how much I loved the plain black ones. The jumper is a chunky knit which is super soft and really comfortable to wear. I love the colour of it and also the way it holds its shape, unlike some knit jumpers I’ve had. The final outfit is made up of a lovely pair of jersey palazzo trousers which are again so comfortable to wear. They look really expensive and I plan to wear them for work once I get them taken up as they’re just a little bit too long for me. I got a blue leopard print cardigan which I got to wear with these trousers but actually, it goes with so many things I have so it’s another thing from this little haul that’s become a bit of a wardrobe staple. 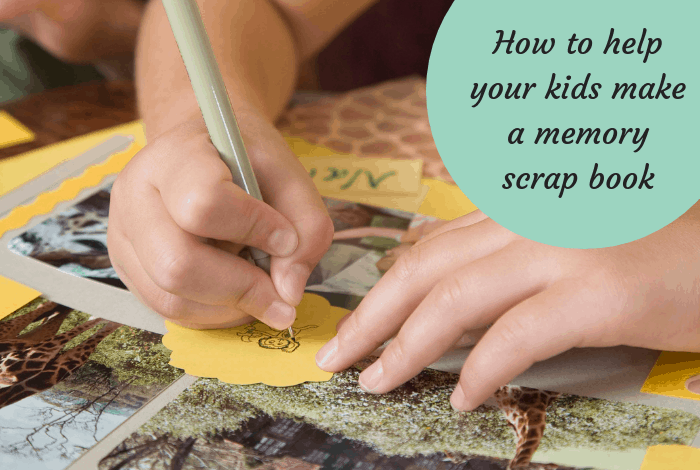 Helping your kids to create a memory scrapbook….